Aquifer is pleased to announce the launch of several new features in Aqueduct to help administrators better manage all types of users. This major upgrade will significantly simplify and improve the workflow for administrative users. Separate student and administrator user panels with new tools. Many convenient options for sorting and filtering user lists. Batch delete administrative and student users. At the start of a new academic year, it’s fast and easy to remove students and administrators who no longer need access. Learn how to remove students and administrative users in Aqueduct. 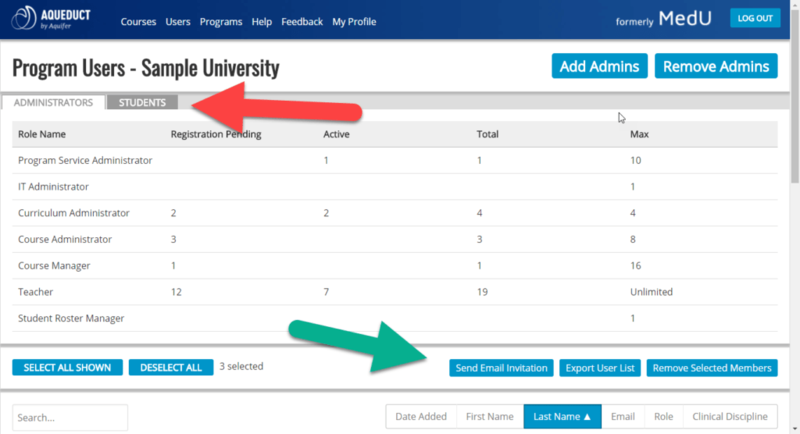 Option to send invitation emails to unregistered users at any time and ability to select a send date for student invitations when they are added to your program. This is a great way to remind students and administrators who have not registered that they have this access to Aquifer courses. Export your user list, including the information available in the new user panel display, to sort and work with as you wish. Sort and filter users by role, registration status, and any field that appears in the user panel for easy use of the export, send email invitations, or remove selected members tools.